Tej Pratap Yadav, the elder son of Rashtriya Janata Dal (RJD) supremo Lalu Prasad Yadav, hit out at a Janata Dal (United) leader in Bihar on Sunday after he compared Misa Bharti to Shurpanakha (the sister of the demon king Ravana). Patna: Tej Pratap Yadav, the elder son of Rashtriya Janata Dal (RJD) supremo Lalu Prasad Yadav, hit out at a Janata Dal (United) leader in Bihar on Sunday after he compared Misa Bharti to Shurpanakha (the sister of the demon king Ravana). Hitting out Tej Pratap hit back at Neeraj Kumar saying the spokesman of Bihar chief minister and JD(U) president Nitish Kumar has no sense of decency. “He (Nitish Kumar) must ask his spokespersons to exercise restraint while speaking, else I will drag them to the court,” the former health minister of Bihar told reporters while threatening to file a case against the JD(U) MLC. In the epic, Shurpanakha has been depicted as a seductress whose advances are spurned by Lord Rama. When she approaches his younger brother Laxmana, he chopped off her nose and ears with a sword. It infuriated Ravana who abducts Sita to avenge the insult. The JD(U) spokesperson, in a tweet, made the oft-repeated charge that the RJD supremo had deviated from the Indian tradition by choosing his younger son Tejashwi Yadav as his political heir ignoring Tej Pratap, the elder one. “(In the Ramayana) Bharat had marched to the forest and implored Lord Rama to return. But today, the situation is reverse. The younger brother is in a position of power, the elder one has been forced to live in exile and Shurpanakha is being denied even a small territory,” JD(U) MLC and party spokesman Neeraj Kumar tweeted. 'भरतमिलाप' में भरत पूरे परिवार के साथ जंगल मे राम को वापस लाने गए थे.परन्तु आज की स्थिति उलट है.. Although he took no names, his tweet was an obvious reference to the ascendance of Tejashwi Yadav as the party’s de facto leader in the absence of Lalu Prasad, who is serving sentence in fodder scam cases. 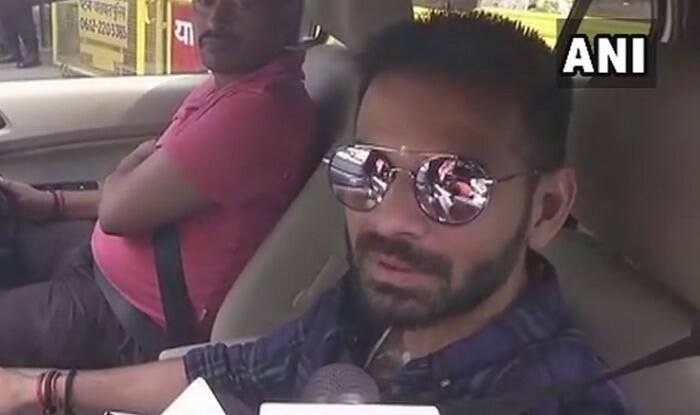 On Thursday, Tej Pratap had said that his eldest sister Misa Bharti will contest the Lok Sabha elections 2019 from Pataliputra seat. The Pataliputra seat that was carved out in the 2008 delimitation is seen as a prestige issue for the “first family” of the RJD as both Lalu Prasad and his daughter Misa Bharti have unsuccessfully contested from there. While Lalu Prasad had lost the Pataliputra set to Ranjan Yadav in 2009, who was contesting on a JD(S) ticket, Misa Bharti lost the seat to Ram Kripal in 2014.